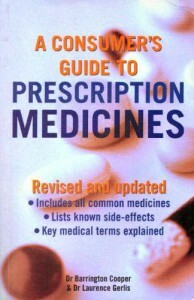 It's hard to see the use in this book other than making money for those book sellers who leave piles of books around your office every couple of weeks – it's a comprehensive list of prescription medicines, with each entry including strengths available, dosage, availability, active ingredients, brand names, side effects, cautions, those who the medication shouldn't be used for, and drugs or supplements where caution is needed if taking with the medicine. It seems slightly unfair to criticise the book for doing exactly what the title states, but there's no insight into any of the medicines, they're listed alphabetically rather than sorted into functional groups, e.g. Beta blockers, painkillers, and the information your doctor gives you when prescribing the medicine and the information on the PIL will be more thorough, AND you can find more up-to-date reference material on the NHS website, which will also put things in proper context. I said 'exactly' what it states on the cover, but in actual facts the writers claim "Key medical terms explained". I just looked through the whole book and couldn't find any. They are used, yes, but nowhere are they explained. If you want to learn about medicines, take a proper course in pharmacy, pharmacology, nursing or medicine. This book will just waste your time. Best use would be to prop up a corner of your armchair, something to fling on the floor in moments of rage, or just to line your pet rodent's cage.